“Out of the shadows and into the light – Hydra.” The events of Captain America 2: the Winter Soldier have set off a bunch of chain reactions throughout the Marvel Universe, but none more than Marvel’s Agents of S.H.I.E.L.D. This week, Agent Coulson discovers that the organization he’s devoted his life to is rotten to the core. With S.H.I.E.L.D. destroyed and the list of trustworthy people shrinking every second, will the team be able to finish what they started – or even survive? We know that this episode deals with the fallout from Captain America 2: The Winter Soldier, but just when does it take place? Let’s think this one through. Remember that the events of Captain America 2: The Winter Soldier take places in a very short period of time – 3 days. When the team learns of Hydra’s presence and gets captured after an encounter with the Winter Soldier, there is less than 16 hours till Project Insight is launched. Hydra wouldn’t send out that signal unless one of 2 things had happened: their presence was revealed or their plan had progressed far enough that it reached the point when nothing could stop them. Either scenario would make them reveal themselves, but which happened first? 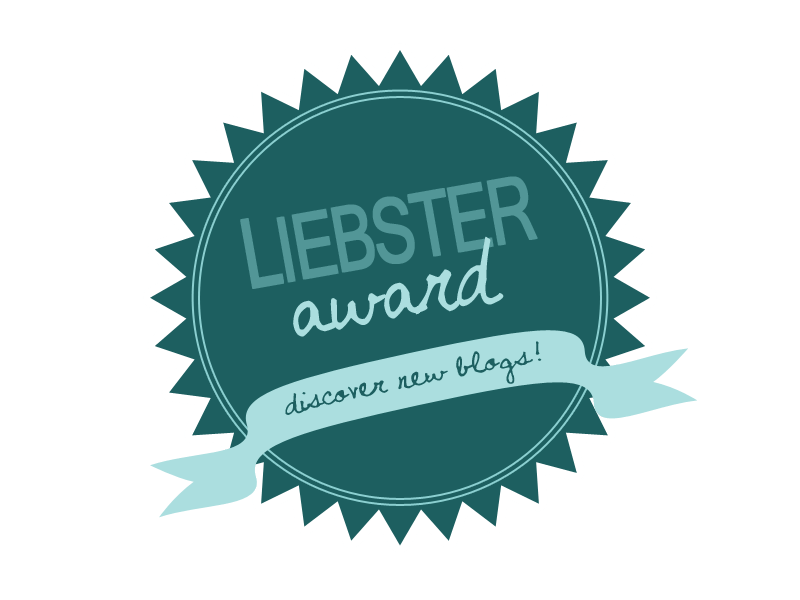 Since the Triskelion – S.H.I.E.L.D. 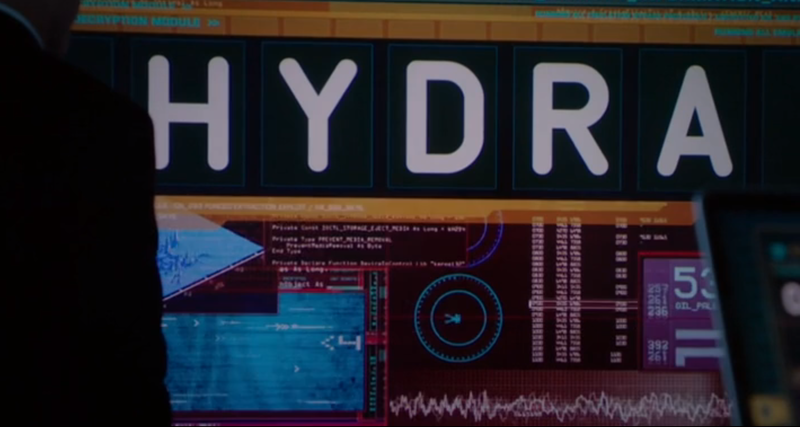 headquarters – wasn’t in a state of panic before Captain America’s speech revealing Hydra, it’s safe to assume that this was the latest possible moment that Hydra message went out. There was no panic about outside communications being blocked by a signal. Ergo, it had to have happened after this or at least a little bit before. The events of this episode end with the Helicarriers having already been taken down and Captain America unaccounted for. At most, the events in this episode took place over the course of about 5-6 hours. Considering their high-speed plane, little time to plan actions, and proximity to The Hub – where they were being rerouted to – the longest amount of passed time happened on the plane. Everything else happened very fast. Hand informing Coulson at the end could also be what she’s learned since communication was restored – rather than the Helicarriers JUST going down. Finally, take into consideration what Garrett said about Hydra being comfortable in S.H.I.E.L.D. They would have been fine staying hidden until after Project Insight already killed everyone who wasn’t with them. Why start a fight when you can kill all your enemies in a few hours. Captain America calling Hydra out was the catalyst that caused the signal to go out. In conclusion, the events of this episode began towards the end of Captain America 2: The Winter Soldier, but ended slightly afterwards once communications had been restored and Hand could discover what had been happening at other S.H.I.E.L.D. bases. A lot of people have been speculating that the voice on the phone was Captain America, but that is false. The voice is not Chris Evans and further more, the voice doesn’t even have the tone Steve usually conveys. There would be a bit more remorse or sorrow in his voice, but these lines are delivered with too much conviction. Also, if it were truly Steve Rogers, why would they not show him – and seemingly have someone else deliver Chis Evan’s line. People figured Fury’s direct line would be his cell phone, but Captain America wouldn’t have had his phone on him. If anything Fury himself would have it on him if it were truly his phone – or at least Maria Hill. The timing is also wrong, as the events of this episode takes place during the initiation Project Insight and its aftermath. Captain America would have been too busy to be taking calls. So no. Sorry, that was not a Cap Cameo. If you want that go re-watch Thor 2: The Dark World. This was all to protect Coulson because May truly cares, but this is the worst time to reveal it. She’s broken Phil’s trust and after the events of this episode, trust will be a very big thing. Though even though he can’t call her a friend anymore, he’ll still see her as an ally – because they’ll need all the help they can get. In order to discern whom she can and cannot trust, Agent Hand offers every agent she comes across a choice: ‘swear unwavering loyalty to Hydra or share Fury’s fate’. Though it seems anyone that is too difficult to track down, just shoot. After hearing from Agent Blake that Coulson might be a traitor, she immediately decided to kill his entire team and question him. Though one must also wonder if Agent Blake was a S.H.I.E.L.D. faithful. With Sitwell as his past partner – and considering it all played into Hydra’s hand quite nicely – I wouldn’t be surprised if he was a Hydra agent who took a few fractured ribs for the team. Coulson realizes there is no other way Garrett could know that since he never put that in the report. In fact, he never told anyone about that. Everything starts to make sense. Remembering Quinn’s last words, Coulson did lead the Clairvoyant to the cure – literally. In a final shocker, even Coulson’s own team isn’t as trust worthy as he once thought. While transporting Garrett to the Fridge, Agent Hand asked Ward if he would like to burry his traitor of a mentor a little deeper, which leads Ward to shoot the bodyguards in the head and then unload the rest of his gun into Agent Hand. This leads to so many questions. One could say that it was all staged by Coulson and Hand to get someone on the inside, but those certainly weren’t ‘icer’ bullets. Also, what would be the need of getting on the inside after all the trouble they went through to find the Clairvoyant. I think Ward has actually changed sides. Look at the difference between his and Agent Triplett’s reactions when Garrett is taken away. Triplett is livid and screams about how he trusted him. Ward on the other hand is silent and barely shows any emotion. Both are strong reserved agents, with two very different initial reactions. Even though Ward seems shocked and silent later, the immediate reaction will always show true colors. Garrett was being marched out with other Hydra traitors; there was no real need for Coulson to explain to make him ‘understand the situation’. Though even if Ward has changed sides, that doesn’t mean he’s okay with it anymore. Earlier in the episode, he told Skye how with her he couldn’t compartmentalize things. Even Garrett commented last episode about how he seems different since being around Skye. Ward might have been Hydra all along, but that focus on his face after killing Hand shows deep regret. Perhaps Skye has gotten him to realize just what an awful thing he is doing. He could very well have a redeeming moment, although I think he’ll never be able to be trusted again. This leaves him dying in the finale in a selfless act – at least that’s my thought. I was never really a fan between his and Skye’s relationship. 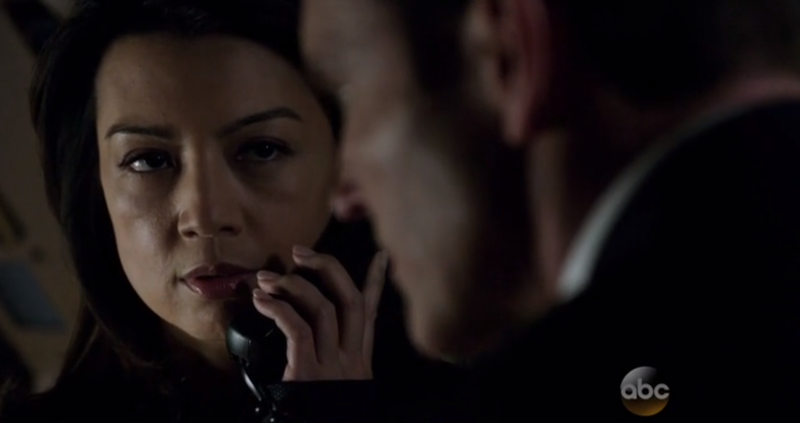 I’m a much bigger fan of Coulson and Skye’s father/daughter relationship. I think they’re the two that can most easily make the transfer into the bigger Marvel Universe and that would be less interesting if Ward has to come along for the ride too. Though speaking of Skye, earlier in the episode she gave Ward a hard drive that housed all of the secrets of their encounters in order to keep it safe. It wasn’t specified whether or not he gave it back to her, so there is a very good chance that Hydra now has all of their secrets. Whether he’s betrayed for good, this is all part of a larger plan, OR is being controlled by an eye implant; we’ll have to wait to see. In a few weeks, Cobie Smulders is set to return as Maria Hill – last seen applying for a job at Stark Industries – in an episode full of Coulson/Hill team-up beat downs. In addition to Hill, Nick Fury himself will actually appear in the season finale. Will this be the beginning of Team Avengers or will this introduce a Season 2 focused on helping Nick travel the world hunting down Hydra? 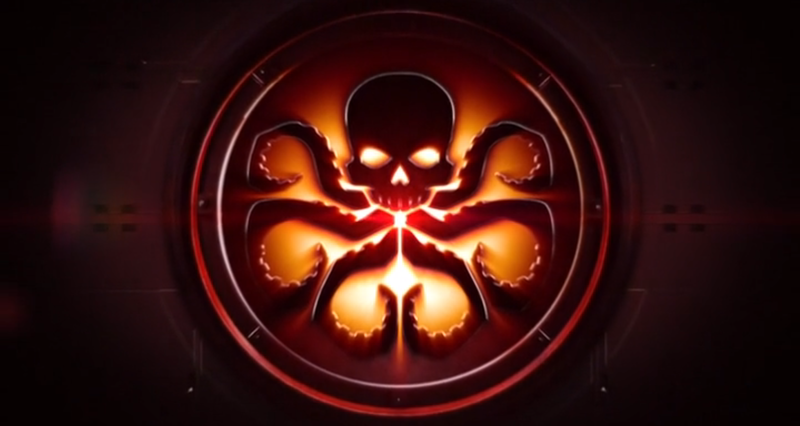 Whether it concludes in one season or evolves into something else in Season 2, the events of Agents of S.H.I.E.L.D. will definitely tie into the Marvel Cinematic Universe. Last episode they briefly mentioned a few S.H.I.E.L.D. bases have fallen to Hydra, one of which in Each Africa and another called the Tree House. It just so happens that the beginning of Avengers is a huge action scene that takes place in South Africa. 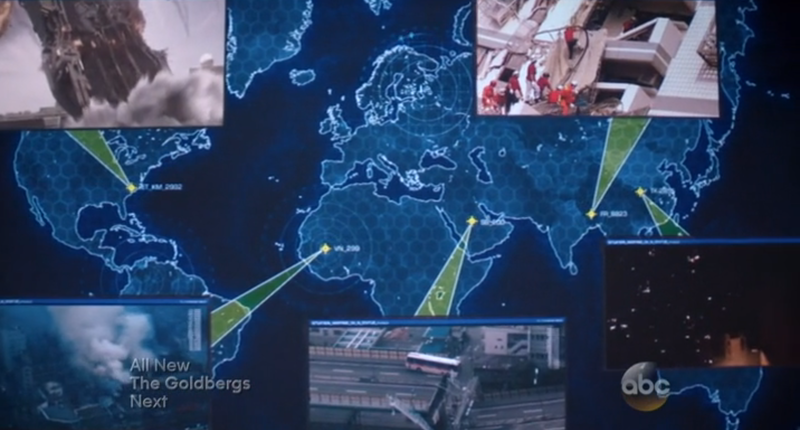 Could this be connected to one of those Hydra–controlled bases – maybe it’s even the one where Quicksilver and Scarlet Witch are being held. We know Baron Von Strucker wants to use them to distract the Avengers from their bigger plans – Ultron perhaps – and that these twins eventually join the Avengers. It would make sense that they’d be introduced early on so that there would be enough time for a believable conversion.